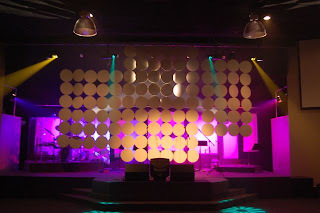 jakesumner.com: New stage design for "Unwritten"
New stage design for "Unwritten"
Here are a few pics from our latest stage setup for the "Unwritten" girls event we had last night. Hannah and Jenica led worship with a band of guys backing them up. Since it was supposed to be an "all-girls" night, we wanted to hide the band guys a bit so we found a place to buy cardboard circles. 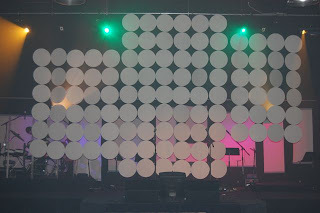 We zip-tied these together to create a "curtain". 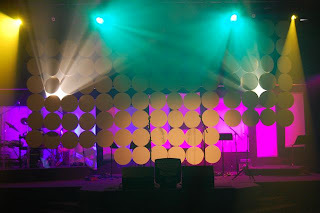 We were able to shine lights on and through the circles to get some cool effects. 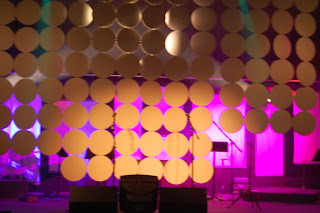 Overall, very effective and inexpensive (about $40 for zip ties and all the circles! ).